A late penalty from Michael McCrudden earned Institute a deserved share of the spoils with Coleraine in an entertaining clash at The Showgrounds. The visitors had a deserved half-time lead after Dean Curry headed home from a corner, but couldn't hold that advantage for long into the second half as Jamie McGonigle pounced with a well taken effort, before Brad Lyons headed home. However, 'Stute drew level on 79 minutes when McCrudden stroked home from the spot. The first chance arrived after only two minutes when Eoin Bradley's drive from the edge of the box sailed by the far post. Minutes later, the visitors had an opportunity as the in-form McCrudden robbed Gareth McConaghie but the striker's lob failed to trouble Chris Johns. It was McCrudden who threatened on two occasions as he dragged an effort wide before sending a free-kick over the crossbar. The Irish Cup holders got a foothold in the game with Jamie McGonigle having a shot blocked by Martin Gallagher and Lyons having a goal-bound chance blocked by the legs of Caoimhin Bonner. However, after Lyons blasted an effort over the bar from the edge of the box, Institute took the lead when Dean Curry headed home unmarked from Gareth Brown's in-swinging delivery. Paddy McLaughlin's side almost doubled their lead moments later when a fantastic cross by Jamie McIntyre picked out Gareth Brown at the back post, but his header was saved by Johns. The visitors were left to rue that chance when Stephen Lowry's cross picked out McGonigle, and the Northern Ireland Under-21 international swept home his 50th goal for the Bannsiders on 53 minutes. Oran Kearney's men almost took the lead on 57 minutes when a cross by Darren McCauley was flicked on by Bradley into Ian Parkhill, but his drive was kept out by Gallagher. Just after the hour mark, the Bannsiders had Johns to thank when the stopper was alert to keep out Stephen Curry's well hit free-kick. 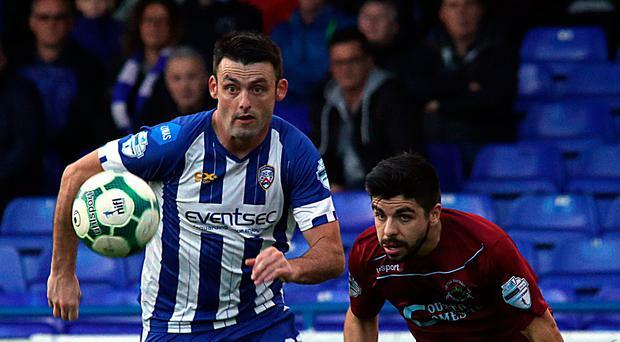 Coleraine hit the front on 71 minutes when Aaron Traynor's ball picked out Lyons and the midfielder made it two goals in as many games as he powered his header past Gallagher. Remarkably, 'Stute drew level on 79 minutes after Callum Moorehead was brought down inside the area by Lowry. McCrudden - who had netted two penalties already this season - comfortably dispatched a third. The Championship winners should have taken the lead minutes later when Jamie Dunne ran clean through but his final ball failed to find McCrudden. Both sides created further chances but it was a hard earned point for Institute, who moved up to fourth place in the table on seven points ahead of today's action. COLERAINE: Johns, Lyons, McCauley, Lowry, Bradley (Gawne, 87 mins), Crown, McConaghie, O'Donnell, Parkhill (Harkin, 67 mins), Traynor, McGonigle. Subs Not Used: Doherty, Mullan, Douglas. INSTITUTE: Gallagher, R Morrow, McLoughlin, Bonner, D Curry, S Curry (Henderson, 73 mins), McCrudden, Jarvis, Brown (Dunne, 60 mins), McIntyre (Moorehead, 73 mins), Wilson. Subs not used: Doherty, J Morrow, McCready, Canning.